As well as people moving into Ashburton, there have always been people moving away. 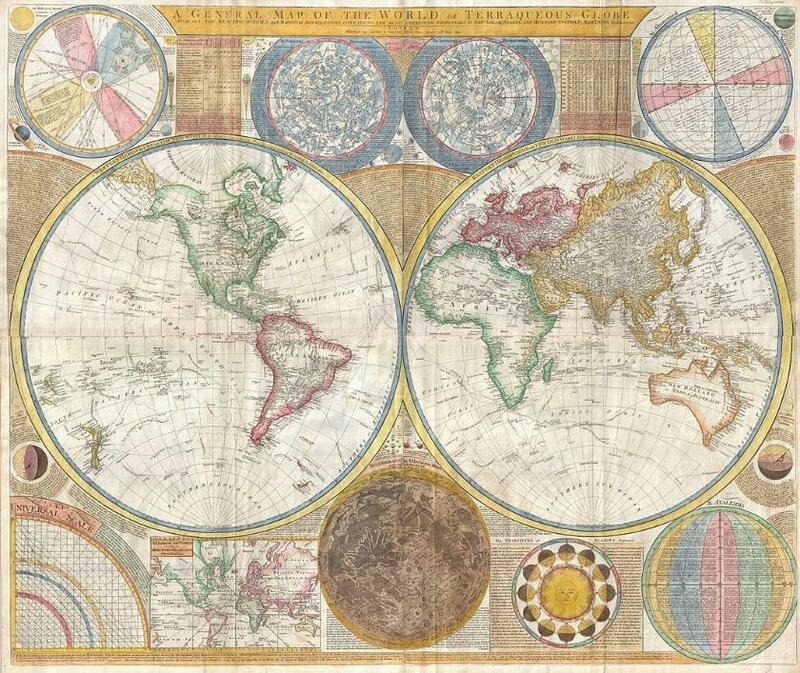 Above: 'A General Map of the World, or Terraqueous Globe, with all the New Discoveries and Marginal Delineations, Containing the Most Interesting Particulars in the Solar, Starry and Mundane System.' Samuel Dunn, 1794. From the 1500s, West Country people sailed to Newfoundland in search of cod. They made the hazardous crossing in spring, sailing into the still-frozen waters in small wooden ships. The fish they caught was dried and salted; they returned home in the autumn. At different times ports such as Plymouth, Dartmouth, Teignmouth and Topsham were heavily involved in the trade. Sir Humphrey Gilbert, a half-brother to Sir Walter Raleigh, claimed Newfoundland for Queen Elizabeth 1 in 1583. Other commodities mentioned are: cod oil, seal oil and a few seal skins (the duty on the last named was high). See also The Tucker Family, under Individual Families, 2. It seems likely that the Mary Stripling above is the same Mary Stripling, singlewoman of Ashburton, Devon, who left a will dated July 1st 1836. It can be seen at (or downloaded from) the National Archives. Inevitably many people stayed in Newfoundland - 35% of known English immigrants came from Devon. A large proportion of these came from the ports, but a sizable group came from the market towns of the county. Ashburton was one such town. Anglican Cathedral of St John the Baptist, St John's, Newfoundland. When William Coaker died, aged 62, in St John's in 1900, he was described as the son of Jonas Coaker, of Ashburton, and Anne Jenkins. In 1829 the death was reported of Thomas Matterface, at St Lawrence, Newfoundland. He had died on January 26th in his 33rd year, and was the eldest son of J Matterface of Ashburton. Walter Bickham died in January 1833, aged 65. A native of Ashburton, he was described as an 'old respectable inhabitant of this Town'. October 24th, 1833. William Foote, a native of Ashburton, Devon, was buried, aged 25. Burials St John the Baptist Anglican Cathedral, 1825 - 1855, District of St John's City. 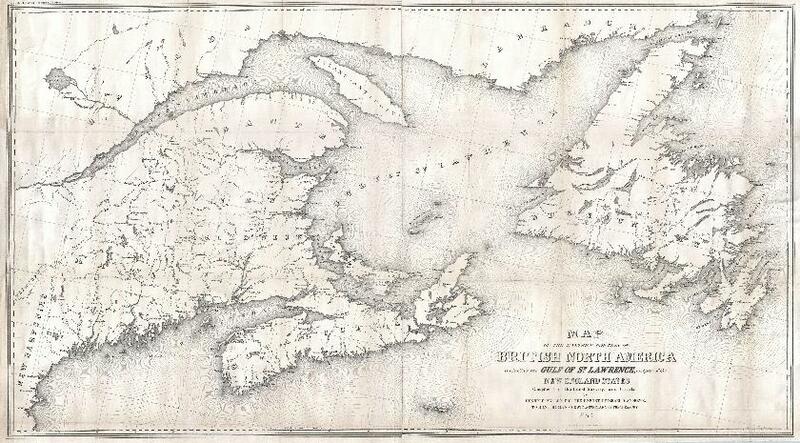 In 1841 the stock in trade of Batten, a currier of Ashburton, was insured for the duration of a voyage to Newfoundland. Mr Batten was emigrating. Many thanks to Karen for the above account. Charles Bates, a Wesleyan missionary in Antigua, West Indies, left a will that passed through probate in 1845. He mentions Elizabeth W Bearns of Ashburton in Devon, sister of his late wife Sarah; also the children of the Revd. George Ellidge, who was married to another sister, Susan. William Bearns of Ashburton is one of the executors. Susanna had returned to England and was living in Holsworthy at the time of the 1861 census. Her husband was George Ellidge, Wesleyan minister, and they had a 17 year old daughter, also named Susanna, who was born in Newfoundland. By 1871 Susanna and her daughter were in the Isle of Wight with her 31 year old son, George Wesley Ellidge, as head of the household. Like his sister, he was born in Newfoundland. 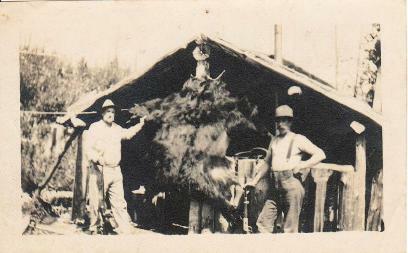 Above: The photograph of two men with a bear was sent to Mr Butler of the Sun Inn. Entitled Ashburton Farm, it was sent from somewhere in Canada (the address is indecipherable). Reference is made to Mabel and Minnie being grown since the writer last saw them - Mabel Butler, the youngest, was born in 1899. John Edgecombe, of St John's, New Brunswick, died in February 1921. The brother of W H Edgecombe, the Ashburton postmaster, John had formerly been an outfitter in the town. His gross estate was £4000. In 1949 George Holden Pinkham visited from Boston, Massachusetts, and told how his direct ancestor, Ephraim Pinkham (Pingum), left Ashburton in 1631 and sailed to America from Plymouth. Ephraim had married Mary Brown, whose father Peter* had gone across on the Mayflower. 1847 The Mersey arrived safely in Quebec with some passengers from Ashburton. It had left Torquay in April. In 1844, a large sale of animals and equipment was about to be held at Higher Mead Farm. Sheep, bullocks, horses and pigs were for sale, together with hay and straw. Also for sale were carts, a winnowing machine, harness, a stone roller and various other items. The sale was without reserve. Roger Hannaford emigrated to America shortly afterwards. Roger and Mary Hannerford, together with 8 children, feature on passenger lists to New York in the final quarter of 1844. They were intending to become inhabitants of the United States. Roger, a farmer, was 40 and his wife 34. The children were: John William, 11; Roger, 10; Frances, 9; Joseph Northcott, 8; Sarah Ann, 7; Ebenezer, 4; Edwin Augustus, 3, and Robt. Hamlin, 1. The 1850 census of Green Township, Hamilton County, Ohio, shows Roger Hannaford, 46, living there with his wife Mary, 39, and 7 children, ranging in age from 7 to 16. All were born in England. The Western Times reported in 1852 that Mary Hannaford had recently died in Cincinnati, Ohio, America. She was the wife of Roger Hannaford, late of Higher Mead Farm, Ashburton. She was 42. In 1863 a letter was published in the Western Times from Roger Hannaford, Hamilton, Ohio, to his family in Devon, on the subject of the civil war. 'It gives the liberal American's view of the causes of the war.' In it he says that [his son] Ebenezer was severely wounded at the battle of Murfreesboro', Tennessee. Roger Hannaford Jnr., 'formerly of Sercombe Farm, Widdicombe-in-the-Moor', married Susan Wardle, eldest daughter of C Wardle esq., at Cheviot, Cincinnati, Ohio, on December 27th, 1855. One of Roger Snr. 's sons, Samuel (1835 - 1911) became a noted architect in Ohio, designing over 300 buildings locally plus others further afield. When the ship docks at Quebec, John visits Mr Woodley and family - George Luscombe is lodging with Mr Woodley. He also sees Richard Soper, Richard's wife and brother. *This may be a mis-transcription, as only J Easterbrook is mentioned again. Transcript by J M Sherby, New York, 1980s? In 1851 James McDowell's son, John, arrived home in Ashburton from California. John had been working the Liverpool to US packet ships for 20 years, and had crossed the Atlantic seventy four times. In 1849 he had gone with thirteen others from New York to the gold diggings in California, and brought home some large nuggets of gold. One in particular, from the Spanish Low diggings, weighed 10¾ ounces. This and other finds ensured him a comfortable future, although he was not yet 34 years old. In 1853 the ship Spermaceti also made the trip from Plymouth to Quebec, arriving on August 30th: her commander was Captain Moon. Several passengers were from the Ashburton area. In 1853 William Ireland, an Ashburton builder, set off for America with his family, via Bristol and Liverpool. A large number of Irish passengers were aboard the ship, the Emma Fields, and a 'raging fever' broke out before they reached New York. Mr Ireland was one of those who died. 1854. People were about to leave Ashburton for America, embarking at Plymouth. They were sailing on the ships Lady Peel and Rose. Several people from Ashburton were also about to leave for Melbourne, Australia, to try their luck at gold digging. Letters had also been received from Toronto, Canada, where some Ashburtonians were now living. Wages were described as being high, 'and provisions cheap'. When the emigrant ship the John was lost in 1855, 'much excitement' occurred in Ashburton and other towns in the area, because local people were aboard. The towns included Bovey, Newton, Lustleigh, Chudleigh, Teignmouth, Staverton and Totnes. In 1870 Captain's Steward Ashmore died when HMS Captain was lost at sea. He left a widow and two children in Ashburton. In 1871 Annie Ashmore, a widow aged 24, is living with her parents Thomas and Sarah Squires, near the 'Arch at the back of North Street'. With the family are Mary aged 2 and Bessie, 9 months, shown as the grandchildren of Thomas. As the 1871 census was taken on April 2nd, this means that Bessie was born round about May/June 1870. William died in September. The 1891 census shows Mary and Bessie Ashmore, aged 21 and 20 respectively, living in Union Street, East Stonehouse. 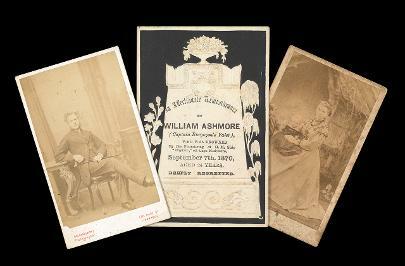 Born in Ashburton, they are with their mother Annie and their step-father William H. Northcott. In the north transept of Westminster Abbey is a stained glass window and memorial brass to those who were lost when the ship HMS Captain sank. The brass memorial reads:"The stained glass window above commemorates the foundering of HMS Captain on Sept 7 1870 when Capt. Hugh Burgoyne V.C. Capt.Cowper Coles C.B. with 49 officers and 402 men and boys perished off Cape Finisterre in the service of their country. The names are recorded on brasses in St Paul's Cathedral"
There was some controversy about the ship, which had been designed by Cowper Coles. When returning from Gibraltar the ship sank in 'a moderate squall' - there were only eighteen survivors. A court martial was held on the loss of HMS Captain, with much discussion about the stability of the ship, built by Laird Brothers. Mr. Reed, 'late chief constructor' of the navy, had noticed the large area of sails, and had drawn it to Mr. Laird's attention. He considered that Captain Coles and Mr. Laird were the people responsible for the design and construction, not Admiralty officials. Mr. William Laird said that additional weight had been added to the ship at Captain Coles' request. Investigations concluded that 'pressure of sail' in conjunction with 'heave of the sea' had caused the ship to capsize. No blame was attributed to any of the survivors, nor to Mr. Reed's department, but regret was expressed that the final construction of the ship varied from the original designs. 1873 The White Star Line's steamship Atlantic was wrecked off Halifax: James Baskerville, a quarryman from Ashburton, was amongst the passengers. At the time of the Exeter Flying Post's report, the numbers of dead were uncertain. 1889 also saw the death of William Satterly from Ashburton. He had been working in a mine in Lorelto, Michigan, US, when a piece of timber fell on his head - he only lived for an hour after the accident. 1892 The West Country Men in Natal held their annual dinner in Pietermaritzburg. The guests included Col. Tucker C.B. ; L C Bastow; A H Foaden and Sergeant Bowden (11th Hussars), all from Ashburton. Several members of the Endacott family settled in America around the turn of the 20th century. See Musicians, Poets and Artists, under Famous Ashburtonians. In 1891 William R Townsend, 'horse man' and his wife Amy are living in North St., with George Leaman, a cow-keeper (thought to be Amy's father - her maiden name was Leaman). They had married in 1879 and already had 5 children, and by 1896 had at least one more - Charles Stanley Townsend. According to the Carnamah Historical Society and Museum's website Charles fought in the First World War, and emigrated to Australia in 1922. He was a passenger on the steamship Osterley, arriving in Fremantle in March of that year. The SS Osterley was built in 1909 by the London and Glasgow Eng and Iron Shipbuilding Co.
Left: The steamship Osterley at sea. Mr William Joint died in 1894. He had been born in Ashburton, but had settled in the United States in 1856. He had served in the C 14th Massachusetts Infantry Cavalry during the civil war, until injured from a fall from a horse. He left shoemaking* and established a successful grocery business, and married twice. Robert Orford Jones, LRCP and LRCS Edin., died in New Zealand on January 1st 1909. He was the only son of J T Knowles-Jones, MD, of Waverley, Ashburton. In 1916 Pte Ernest Nicks, of the 7th Canadians, married Miss Mary J (Polly) French at St Andrew's Church, Ashburton. Ernest was the son of Mr and Mrs M Nicks of East Street, and had left for Canada before the war. He had come over to England with his regiment over a year before, been sent to France and had been severely wounded in the shoulder. His brother, W J Nicks, was best man at the wedding. Both E Nicks and W J Nicks were in the Ashburton Association Football team 1905-06. It seems likely that they were the two brothers above. See Sport, under Gathering Together. Ald and Mrs Solomon Stephens, from Plymouth, went to Jamaica on holiday in 1937. They met an old Plymothian in Kingston, and then stopped at the Montague Hotel about 30 miles away. 'Mine host' was a Mr Oliphant, who had left Ashburton 30 years ago. The Rodgman family, originally from Bideford, moved to Ashburton in the late 1890s. Frederick Eli and Edith Rodgman, patriarch and matriarch of the family, stayed in the town, but all the younger members of the family had emigrated to Canada by the 1930s. Some BMDs (births, marriages and deaths) from Australian newspapers can be found in Some BMDs under People and Properties.